It was an easy 12.5km day through woodland. Walking with Christophe, Jacques and Laurent we knew we were close to Conques but could not see any sign of the village. The woods became denser and the path narrowed. I thought for a while we had lost the Way. 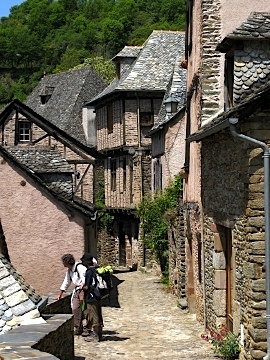 We were only about a kilometre from Conques and still there was no sign of any habitation. We turned a bend in the path and there was Conques before us. 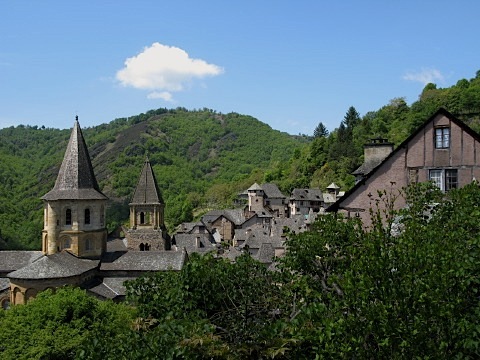 A World Heritage site, Conques is certainly a wonderful place. 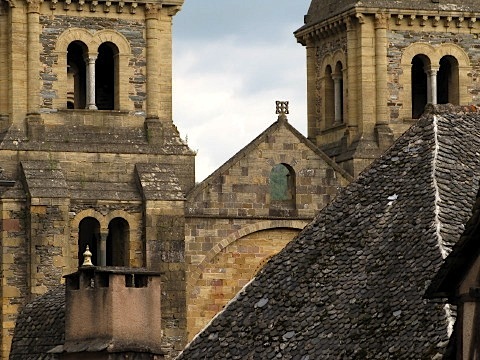 A huge abbey dominates the centre of the village and the other buildings are just as they were in medieval times. Nestled on the side of a hill amongst the dense woodland you really felt that you had travelled back in time. 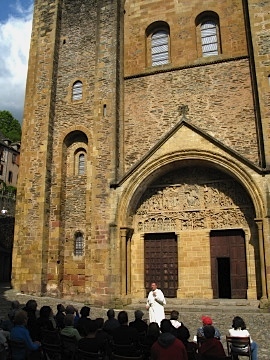 It was about one o’clock and Conques marked the completion of approximately a third of the Via Podiensis between Le Puy and Saint Jean. We celebrated with a big lunch and some good wine at a small restaurant in front of the cathedral. After checking into the Abbaye Sainte Foy I slept most of the afternoon. I woke about 6pm and went out to take some photographs round the village and the abbey. The light was superb and the subject matter fascinating. There were many tourists around. 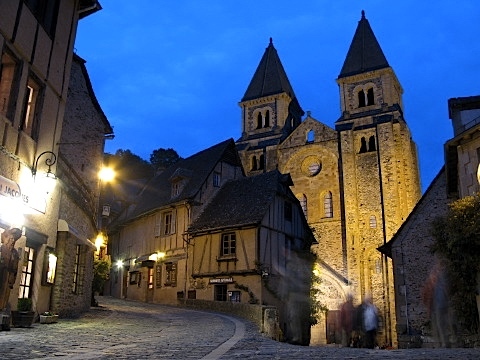 Conques, because of its significance, was understandably a popular place to visit. I felt a little uncomfortable amongst the tourists and tourist shops. 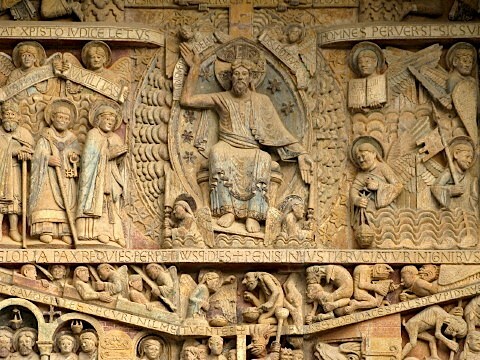 By the cathedral one of the monks was giving a talk on the elaborate carvings found above the door way. The abbey provided a communal evening meal. There must have been 60 people at the long tables in the dinner hall. There was not enough room at the main tables in the hall (I was late as I got carried away taking photos). 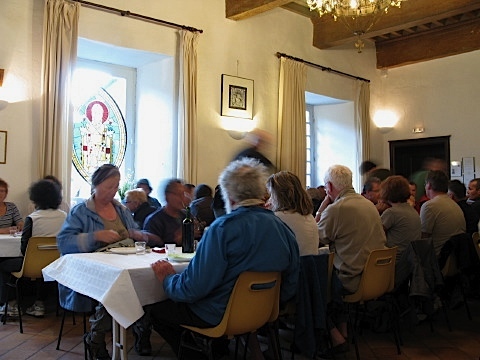 I ate with three other pilgrims and with the volunteer staff in a small adjoining room. I discovered later that we had been well fed compared to the others as we had a wider choice and had lots of left over food from the main hall. There was a pilgrim mass at 8pm and I was asked to read a few lines in English being one of only two native English speakers staying at the abbey that night. Following the mass there was an organ recital in the huge cathedral. The light was dim and the cathedral cold and damp. Some of the organ music was sombre and some of it very uplifting. It was all dramatic music in a very dramatic setting.